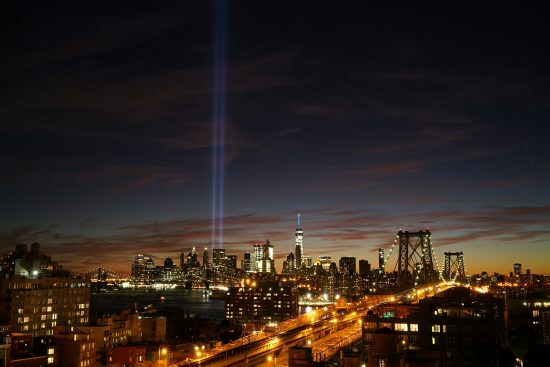 Seventeen Years After 9/11: What is the Global Cost of Terrorism? Seventeen years ago today there were four coordinated terror attacks across the United States. During the attacks, 2,996 died. What’s more is it has led to an environment where terrorism is always in the back of our minds. It has led to wars and there have been a number of other attacks around the world since. So, what is the true cost of terrorism? The European Union alone lost €180 billion in GDP between 2004 and 2016. In the United States, we’ve spent $2.8 trillion on anti-terrorism efforts since the attacks on 9/11. It accounts for one-fifth of the government’s budget. The attacks on 9/11 were estimated to have a cost of $27.2 billion, however, that only accounts for the direct cost. It doesn’t take into account counterterrorism efforts and additional spending that has gone into preventing another attack. Counterterrorism spending is 10 times higher than it was before September 11. There is no sign of it slowing down either. In 2017, the total expenditure on anti-terrorism reached $174 billion in the U.S. Among countries that fall under the EU, the United Kingdom and France have had the highest economic cost of terrorism. While terrorism has cost the EU €180 billion+ between 2004 and 2016, it has cost the U.K. €43.7 billion and France €43 billion in economic losses. What many people don’t consider is that much of the European economy is based on consumption. Much of it depends on people taking the train, traveling to their tourist destinations, heading out to the malls, parks, etc. In fact, between 70 and 80 percent of the current economy relies on this. Are We Any Closer to Defeating Terrorism? The ultimate cost has been those who have lost their lives in terror attacks and given their lives in anti-terrorism efforts. Although there is no way to get those lives back, many feel that spending on counterterrorism can help prevent future attacks. However, this is not the case. In fact, as spending has increased, so have the number of terror attacks and terror-related fatalities throughout the world. Check out the graph below. As you can see, the number of terrorist incidents has only increased since the attacks on 9/11. Furthermore, if you check out the map view, you can see how much more widespread the attacks have become as well. 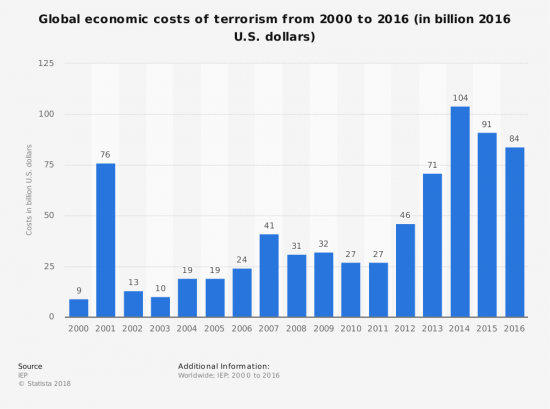 Although terrorism has cost the world’s economy billions of dollars, the number of terror attacks has continuously risen. Because of this many people are afraid of traveling by trains, subways, and even planes because of terror attacks that have occurred around the world. And that is the true cost of terrorism. Readers, what are your thoughts on the global cost of terrorism? Should counterterrorism continue to be such a huge part of our government’s budget? Using Cash Means You’re a Terrorist?